Hippity Hoppity into the Easter holiday. 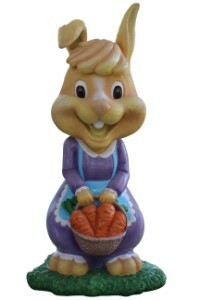 Meet Friskie, dressed in purple dress with a blue apron, carrying a basket of carrots. She is 31" and made of polyresin. Children of all ages will love these bunnies, they are ear-risistible.